The game started at a brisk pace but it was Penicuik who created the first chance when a Montgomery cross was partially cleared to the edge of the box where Walker shot for goal, but his effort went wide of the target. Three minutes later an excellent diagonal pass by Gay picked out Harvey, but his strike drifted wide of the upright. In the 19th minute with Penicuik applying the pressure, a neat one two between Barr and Miller saw keeper Rachojski well place to save Barr’s strike. Then Harvey came close when he headed a Gay cross inches over the crossbar. Whilst Penicuik were having the better of possession, Arniston were always dangerous on the break with the pace of Martin and Forster always a threat. 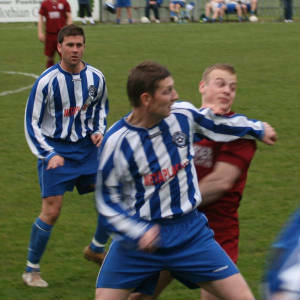 On the half hour, following a goal kick to Penicuik, Walker and Barr combined well to set up Miller. He chipped the ball over the head of his marker twice only to see his shot go narrowly past the post. Minutes later Arniston’s pacey Martin drove through the middle of the park, but his long range effort was well wide of goal. In the 41st minute, a corner to Arniston was flicked on at the post where Nisbet got his head to the ball, but it lacked power and went wide of the post for a goal kick. Right on half time a quick turn and shot by Harvey flashed past the keeper Rachojski’s left hand post. The second half started with Arniston forcing consecutive corner kicks but on both occasions the Penicuik defence held firm. Three minutes later, a Bonthrone strike went inches wide of Bald’s right hand post. In the 51st minute, Harvey and Barr had their strikes on goal, desperately blocked by the Arniston rearguard. Then at the other end, Meikle’s weak header back to his keeper allowed BONTHRONE to nip in and lob the ball over Bald into the net. 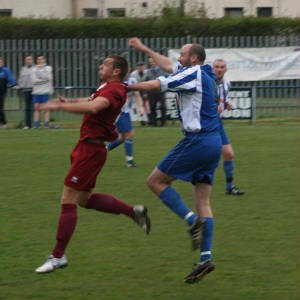 However, one minute later, Penicuik were level again when an inch perfect Montgomery cross was headed home by MILLER. In the 60th minute, Miller headed on a free kick to Harvey, but his volley flew over the bar. Penicuik were fired up by the equaliser and were piling on the pressure and in the 65th minute keeper Rachojski was at full stretch to save another Harvey strike on goal. At the other end, Bald had to be alert to dive low to his right to save a snapshot from the edge of the box. In the 80th minute, a diagonal pass caught out the Penicuik defence, but Bald pulled off and excellent save to turn the ball round the post for a corner. Then a quick break from defence by Arniston saw Nisbet head over the bar when it seemed easier to score. With game swinging from end to end, Barr had a chance, but his strike flew over the bar. In the 86th minute, Penicuik were awarded a free kick on the edge of the box when Gallagher was upended after a mazy run past four defenders. 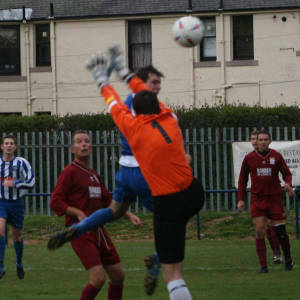 GAY curled the ball Ronaldo style over the defensive wall into the top corner of the net to give Penicuik the lead. 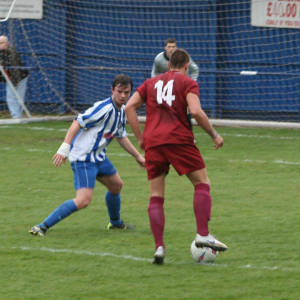 Then, man of the match, Walker saw his strike go inches over the bar. 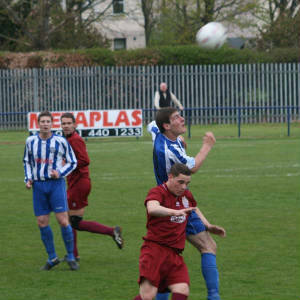 Penicuik continued to press right up to the final whistle for a well deserved victory that could prove crucial to avoid relegation from the Premier League.